After just six months on the scene Freedom Records was rapidly becoming one of the more exciting record companies around, boasting a number of young artists playing cutting edge rock ‘n’ roll in a manner that hadn’t quite been seen yet. With slashing electric guitars, seductive saxophones, rollicking pianos and a steady back-beat the studio band loosely known as The Hep-Cats sounded five, if not ten, years ahead of their time. But perhaps that was the problem in 1949, as their verifiable success was lagging well behind their vibrant output, putting the fortunes of the entire label in doubt. Since occasional kudos for their musical foresight won’t pay the bills as well as cold hard cash will it may have been time to hedge their bets somewhat by offering a few records – or at least a few sides on those records – which presented a less revolutionary style in hopes they might turn the tide of commercial indifference and breathe some life into the company’s finances. It didn’t work of course, but for those interested in the autopsy here’s just such an effort. We can’t entirely fault them for this approach, in that they still let their charges unleash a no-holds barred rocker on the top side with Down In The Groovy while requesting something different of them on the flip. The only problem is – at least from our perspective as rock fans – the possibility that the wrong side would garner the attention and set them off on an alternate course. That didn’t happen, for which I suppose we should be grateful. Far from being a knock on the blues, a cornerstone of American music and one rife with tremendous artists and more than enough brilliant records to do a sister blog covering that genre as it so richly deserves (maybe in the Twenty-Second Century, when I have the time), the fact is at this point in time the two styles were competing for control of the hearts, minds and wallets of black musical community and only one form could ultimately win out. The blues of course had quite the head start on rock ‘n’ roll and were in the midst of a commercial AND creative renaissance at the same time rock music was getting off the ground in the late 1940’s. The country blues idiom with acoustic guitars and sparse accompaniment that had been so prevalent for years was now giving way to urban blues which aside from merely plugging the guitars in was bolstering their sound with full bands. For the next few years you could even make the case that this updated form of the blues was a stronger bet to define the black community’s musical interests in the wake of jazz’s ongoing commercial decline thanks to its deeper roots. But that was also its Achilles Heel for long-term survival, something made clear if you just looked at the audience demographics for the two genres. Blues – electric or not – still appealed predominantly to an older audience, one less impatient for newer sounds and ideas, who once they became fans were content to remain fans indefinitely regardless of the lack of further creative upheavals to keep sounds fresh. Rock ‘n’ roll on the other hand, even at this early stage, was fast becoming the realm of the younger generation and it was that constituency who fueled the innovative spirit which became its hallmark as well as its key to pulling in new fans as they came of age. Each new generation, often separated by just two or three years, sought to put their own stamp on rock and as such it always had new and distinctive sounds to choose from thereby ensuring it’d never become stale and outdated. Among the more recent of those vibrant experiments in rock circles was this group of hell-raisers from Houston, Texas, whose indomitable spirit came across on virtually every song they cut, but who now, on a song appropriately named Helpless, were being asked to temper those innovative sounds to try their hand at something that at least suggested the blues. On the surface you’d think if anyone in rock was capable of bridging the gap between the two ever-widening genres it’d be these guys. 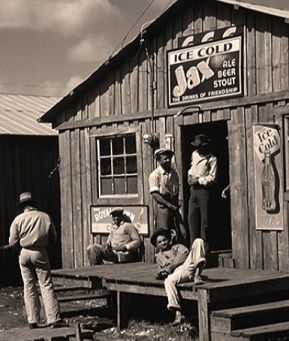 It’d be almost impossible to conceive of them not having plenty of first-hand exposure to the blues growing up in Texas during this period and although the make-up of the band – with multiple horns along with Lonnie Lyons’ piano – was a bit unusual for blues, they weren’t being asked to deliver a straight blues song, just something which hinted at it a little more. 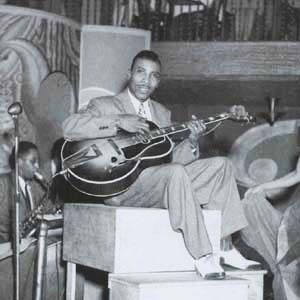 They also had someone in their midst who’d surely give them a leg-up on any rock group trying to inch towards the blues, as guitarist Goree Carter was more than capable of holding his own with anyone from that field. Though he had strongly resisted the label’s urge to put him in a T-Bone Walker blues bag so he could rock out instead, he was no stranger to the blues and was in fact a certifiable fan of Walker’s work. Since this record was being credited to Lyons it gave Carter the freedom to venture more towards the blues without it changing the public perception of him as a pure rocker. Sure enough he kicks this off with a slow single-string drawn-out run that epitomizes the word “lament”. It’s a despondent sound, weary in its outlook and worn-down by untold years of regret. In other words the exact opposite of the way he sounded on most of his rock sides. Where the first crack in the pure blues façade comes into play is the prominence of the horns playing a meandering counterpoint melody that may indeed set the right mood for a song about lost love but which changes the nature of song being established by Carter’s initial approach. Helpless now takes on a bit more mellow ambiance than we were expecting but that shift in tone becomes the least of your worries as it goes along. Since this wasn’t going to be a pure blues song anyway this duality might be effective if they had worked this all out in advance. Then they might’ve been far more judicious in what each of their roles was going to be and made more of an effort to compliment one another in their choices. Instead it sounds as if everyone came up with their own concept independently and then simply walked into the studio without a word between them and began playing as the tapes rolled. As a result everything about this sounds amateurish. For group that had defined cohesiveness in the past this is the polar opposite of that approach. They’re all wandering about the bandstand drunkenly, the horns’ atonal sound clashing outright with the rest of the song at times, completely distracting you from the one passably redeeming component this has going for it, which is the resigned misery of Lonnie Lyons himself. Though not a great singer, Lyons has shown he can be reasonably effective when his duties are kept to a minimum. Here once again he’s trying to channel Amos Milburn, something which is bound to find him coming out on the short end of the head to head match-up with rock’s biggest star, but the more you listen – though this would’ve been impossible to foresee in 1949 – the more you start to pick up hints of somebody else entirely… namely Johnny Ace. His tone, his slow delivery, his sleepy-eyed persona is almost uncanny in its resemblance to Ace, who at this time was a teenaged Naval cadet dishonorably discharged for going AWOL in whatever port he was in that had a working piano. Considering that Lyons would die in 1952 at a young age, leaving behind no photographic evidence of his existence, and Ace was discovered and made his first record in 1952 can we really say with any certainty that Lyons didn’t merely fake his own death, take on a new name and live another two and a half years under a pseudonym? Different singer/pianist though it may be, Helpless makes a pretty good case as being the blueprint for much of Ace’s later work… but with one notable difference, Helpless is a much cruder, less focused and far weaker result than almost anything Ace laid down. For one thing absolutely nothing on this record is in sync. Lyons piano is occasionally spry but that only highlights its incompatibility with the horns. Horns which are no sure bet to still be on their feet when the music ends, so inebriated do they sound. It’s frankly hard to believe these are the same musicians – Conrad Johnson on alto, Sam Williams on tenor and Nelson Mills on trumpet – who carried off their roles so well on other sides to date. Then there’s Carter, the not-so-secret weapon whose bluesy licks are a reasonable – but frustrating – fit for the entire production. Now to be fair he can’t play in any other way due to the confines of the song but his presence here is something of a distraction, not just because of who he is and what he might otherwise have done if allowed to ramp this up, but because he’s taking on the lead accompaniment in what is essentially a role best suited as an accent piece on a song this downcast. Though he’s not intentionally drawing undue attention to himself by WHAT he plays, he still overwhelms everything else just by virtue of the sound his guitar produces. The parts don’t fit in other words. The instruments aren’t compatible on this type of song, and worse still this type of song isn’t really playing to any of the musicians strengths. No matter how kind you want to be to them based on their past work, they’re being done in by a haphazard arrangement which makes this far more aggravating than interesting. Without a better written song with more compelling lyrics and a fresher perspective Helpless is an apt title for the results of this sloppy performance. The idea to tackle this type of blues-rock forlorn ballad is fine unto itself and there’s no doubt these guys had the skill to deliver what this called for. But this comes across as a bad first take of something that desperately needed to be whittled down to its barest essentials… or shaken up completely to let each component have their own brief stand-along spot while sitting the rest of the show out entirely. Instead on Helpless they’re all thrown into the mix at once, each musician running headlong into someone going in the opposite direction until they’re all sprawled on the floor, limbs akimbo and unable to tell which way is up. The blues may be a more simple form of music but it still requires a well-conceived game-plan and this fails miserably in that regard even though certain individual parts if you could extract them from the rest might possibly hold-up. But why would you want to? This is a case of well-meaning stand-ins being tasked with convincing you, and themselves, that in the future the blues would come out on top in the eternal struggle for relevance when all along these guys had already placed their bets on rock ‘n’ roll. That this tries to incorporate a little of both into the mix only serves to show just how wide the split was becoming as time marched on. 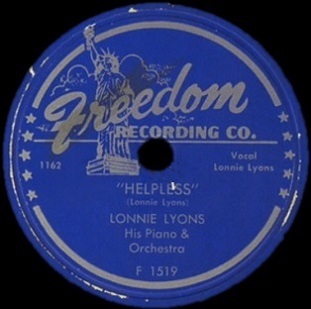 Leave a reply on "Lonnie Lyons: “Helpless”"